The 3D printed car industry has seen a few milestones from Local Motors building the world’s first full-size, drivable, 3D printed car to the “The Rise of Virtually Designed Products . . .” in which SpaceX has been building pieces of its spaceships using 3D or additive printing. Since these developments, the automobile industry has been coming closer and closer to using 3D printing in more and more of its manufacturing activities. 3D printing by automotive manufacturers is evolving rapidly and has reached a point where it will be an integral part of automobile manufacturing and tooling going forward. One provider of very large 3D printed automotive parts is the automotive tooling company Sciaky Metals. The company has designed and manufactured huge 3D printers that allow automotive companies to produce 3D metal prototypes and production parts. The company’s printers employ electron-beam additive manufacturing (EBAM) systems. Honda isn’t the only company heavily involved in this new cheaper, faster, lighter technology: Rolls-Royce, Lamborghini, Porsche, and many more are now tooling up for 3D printing. 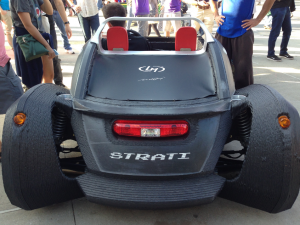 The following video explains how innovative automotive design and manufacturing are coming about through the use of 3D printers, including Stratasys.